i have been called many names in my life (including duchess and queen to name but two), and now i have become “Frau Yamison” as i am processed through a lengthy induction into the german health system. i am called “Frau Yamison” by receptionists, nurses, doctors, dentists, physios, pharmacists … they are of course much more formal here than in new zealand. pretty much all health professionals wear a white uniform all the time, whereas in nz your GP wears normal clothes and specialists usually only don a white coat for hospital work. they also seem to have plenty of time, which is a nice change. i was with an orthopaedic surgeon for well over an hour when i had a check-up for my bionic hip – mind you most of that time i was nodding politely while he delivered a pop-psychology monologue. 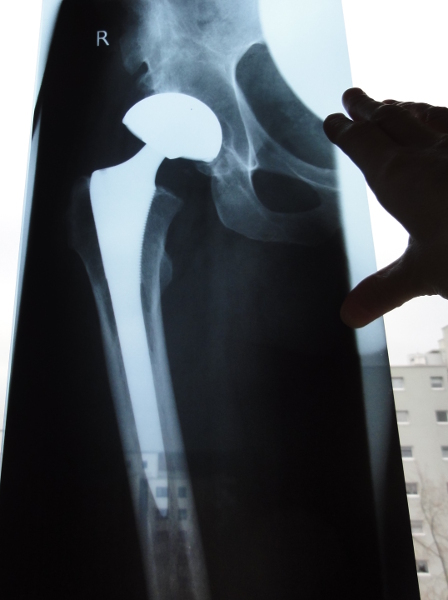 here’s the xray of my hip, 8 years old now – actually it doesn’t look very different to when it was first installed (just that this time it has a bit of munich in the background and a slight upward angle as i was trying to get as much sky as possible). another thing i’ve noticed is that german doctors LOVE ultrasound. it’s standard for a GP to have an ultrasound machine, as well as any specialist from orthopaedics to gynaecology. even if there isn’t anything apparently wrong, they want to rub that sensor over your flesh, then indicate vague shadows on the screen declaring that this is obviously one thing and this another, when to me it all looks very murky and undefined. and speaking of having my body inspected and photographed in various formats, when i returned from the UK yesterday i must have been looking particularly suspicious because not only did i have my regular pat-down at the metal detector, i was “randomly” selected for a body scan and then “randomly” selected to have my mobile phone wiped with something and scanned. i did think about objecting to the body scan, and started asking the woman questions about it, but she clearly had no idea at all about the actual technology and could only tell me what a good thing it was. she showed me the cartoon-like body silhouette it produced, with “points of concern” highlighted in yellow squares (my bionic hip and the zips on my boots) and told me that eventually everyone would have to go through a body scanner to enter heathrow’s departures area. it seems like a crazy amount of technology and scanning to pick up … what? any terrorist with half a brain is not going to carry a weapon on their body that will show up in a scan. it would be much better to invest the same resources into addressing the actual causes of unrest and conflict in the world that make people so desperate that they resort to terrorism, instead of this kneejerk reaction and the silly idea that if we have enough technological controls we can be safe.